Thin bands look pretty but are too weak for normal wear and will bend out of shape easily and can cause Diamonds to fall out. 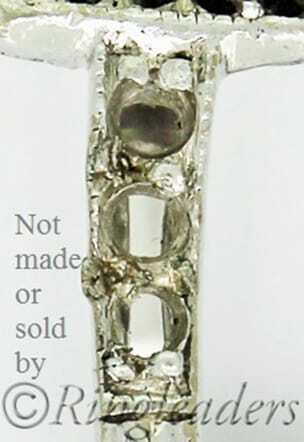 These ultra-fine bands are often combined with weak setting styles that also result in stones falling out regularly. We use our hands for everything and engagement, wedding and eternity rings will wear against each other, making them weaker, thin bands will wear out in a few years. Pic 1. Excessively fine bands, will bend, lose Diamonds and eventually break constantly. 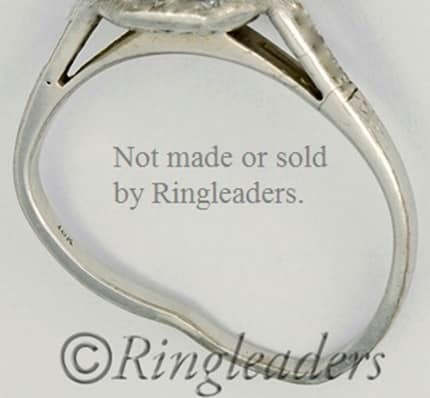 The designer ring below is 9 months old and been repaired 6 times, the 18ct white gold is now stressed it is cracking and needs to be replaced (a very expensive repair). CAD, (computer aided design) operators have replaced real jewellers since early 2000. CAD manufacturing is softer and less hard than handmade, but are often unethically and illegally sold as handmade in shops and especially on line (see Buyer Beware- CAD-Cast is claimed as handmade & Buyer Beware- What are you really buying and from whom). Pic 2. This ring has been fix 6 times in the 1st 9 months. 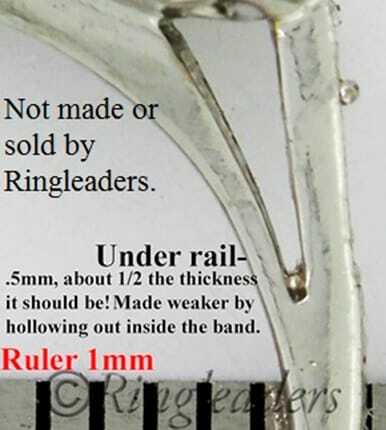 Today worldwide only a tiny percent of jewellery is designed by real jewellers (see Buyer Beware- Jewellers so rare, training to be concluded in Aust), with even less made by jewellers. Pic 3. Repeat bending has stressed the metal and it must now be replaced. Pic 4. Ultra-thin sides with on strength are revealed when Diamonds are removed.